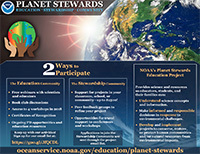 The NOAA Planet Stewards Education Project is the new name of the Climate Stewards Education Project. The program has expanded its scope to include a wider range of NOAA topics related to understanding and protecting our environment. This means we will focus on a larger number of subjects such as decreasing the impacts of marine debris, conserving and restoring natural resources, and understanding and responding to severe weather events. We will continue our programmatic emphasis on climate as a driver of environmental impacts to humans and natural ecosystems. The following are selected archives of the webinars given by scientists, communicators, and educators through NOAA Climate and Planet Stewards program. Want to attend upcoming presentations? Sign up on our email list to receive invitations to future events. Usually scheduled on the first Monday of the month from 7:30 - 9:00 pm Eastern Time, these events provide knowledge and resources that allow educators to build their understanding of NOAA related science topics as well as their pedagogic and communication skills. Climate Change Education: What Works? Marine Debris and What We Can Do About It! Water Water Everywhere Will There Be Enough to Drink? Climate and Marine Ecosystems: What is Climate-Smart Ocean Management? To receive information about PSEP activities and opportunities sign up to our mailing list.